Lavigny feels unreal. Like a fantasy, A Midsummer Night's Dream void of fairies and revels – an enchanting little village of no more than nine hundred people perched on a sinuous green ridge with sturdy quaint houses hemmed in by flowers and vegetables, winding cobbled roads, sprawls of fragrant vineyards, a sprinkle of stables, fields of vivid sunflowers, skirted by lush orchards of apples and groves of pears, and the fey charm of Lake Geneva, sometimes turquoise, at times indigo, then the swells of fantastic Alps brooding in the background, a teasing glimpse of Mont Blanc or the “White Mountain” – the highest mountain in Western Europe, and a sky that gets just as fickle as the wind, like a man’s desire. This is summer, August. And I’m blessed to be chosen as one of the five writers at the idyllic Château de Lavigny, an international writers’ residency in Switzerland. Two writers Paul and Maud are from United States, Sunny from India, and Rachel from New Zealand. Everyone is working on a novel except Rachel, who is busy cutting and polishing her gem poems with the care and deftness of a lapidary: these poems are short and punchy enough to be read on I-readers and on any screens of cellphone, she says. They all speak French, some with flawless flair, others in travelable tones. Aside from merci, voila, oui, tres bien, beaucoup, bon appetit, monsieur, bonjour, and je ne parles francaise, I am hopelessly illiterate – no thanks to Raji Rasaki, a one-time governor of Lagos State. I don’t speak French, but my room is Camus, named after Albert Camus – to every aspiring writer, that is perfectly inspiring. But I don’t have the burdensome seed of genius in me. I have to say I feel both privileged and daunted, though. Privileged, because I might as well mine into the magic of his name, invoke his presence anytime I sense a writer’s block. And daunted, for I might feel too critical and overly conscious and end up not having done any writing at all. Camus was one of the great novelists published by Heinrich Maria Ledig-Rowohlt, a German publisher who also published other greats – Henry Miller, William Faulkner, Ernest Hemingway, Gunther Grass, Vladimir Nabokov, John Updike, Harold Pinter, Jean-Paul Sartre and the rest. Now, de Lavigny belonged to Heinrich, but it was Jane, his late wife, a woman of glamour and charity, who turned the grand castle into a writer’s colony (a gesture that is pitiably beyond the mind of many a multimillionaire Nigerian politician). Each summer the Château hosts 25 creative artists from around the world for a period of three weeks in five different sessions, offering them an ethereal experience of space and serenity, hardly obtainable in a world driven by angst and bustle and speed. The Château was declared open for residencies in 1996. To date, roughly 400 writers have enjoyed creativity and fraternity in this pristine haven. All the rooms are named for writers. Across Camus is Nabokov; Hemingway is next door opposite Rowohlt, the late founder himself. Three beautiful paintings, coloured pencil, oil on canvas and a collage perk up the muted white walls of my room, and twin floral chairs sit in one corner near the bare writing station, which comprised a handy little fan and a slim reading lamp. Near the bureau is a bed-lamp and a table covered in the same floral patterned fabric and that’s next to my bed. Now, that’s the most striking thing about my room – the bed. The room is cosier than some supposedly premium hotels I have lodged, but my bed! I am used to sleeping on 6 x 6. Downstairs is where Rachel lives, Faulkner. An antique bookcase stacked with prized books and exquisite bric-à-brac line the white-and-black tiled passage in a precise manner, while a few paintings markedly curious in motifs catch your eye each time you pass. Upstairs, the passage, covered in furry carpet, has the same remarkable ambience of books and artworks. The entire building hints at grandiose, subtly though. It also speaks of myths and legends, yet in the air lingers an echo of a time not too long ago. The sitting room is wide, filled with more striking curios and precious aide memoire. The backyard unfurls a luxuriant spread of garden and veranda (as commonly found in almost every house within the area), a vast ripple of fields, green and golden, a tableau of well spaced houses, an imposing surge of mountains, and the shimmering dreaminess of Lake Geneva, impressing upon the mind the picturesque beauty of a painting crafted by a hand far more dexterous than Monet’s. In the afternoons the excited hum of bees browsing pollens fills the ivy-dressed window overlooking the downy lawn, a butterfly or two, silent and languid, can be tracing cutting invisible arcs in the air, and sometimes you can pick the scent of ripening grapes, or the leafy smack of hay or mulch being hauled off down the slopes. 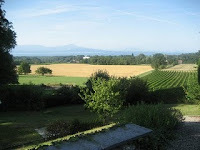 Further away, to the northwest is Etoy, a close-knit quiet village much closer to Lake Geneva than Lavigny. To the southeast, juts a ridge on top of which Aubonne sits regally, tempting tourists and travellers alike to sate on rich historical fare. At sundown, you realise there is so much abundance in Lavingy. Every time I stand on a steep point in the backyard, watching the lazy fingers of dusk sketch dainty petals of crocus in the sky, marvelling at the sheer splendour of it all, my mind readily evokes lines from The World is Too Much with Us and God’s Grandeur. Sometimes I hum Macy Gray’s Beauty in the World as the mellow fragrance of pines and roses and lavenders caresses the lungs. As the temperature drops and each breath drawn is tinged with a chilly prickle, I sense there’s something about the air that both uplifts and inspires the spirit within. I have been to three international residencies and this is what I think. Iowa, USA provided me with ample intellectual stimulation. Delhi, India sharpened my aesthetic ken. And in Lavigny, Switzerland, I grew emotionally plump.